Significant Growth in 8K Ecosystem Expected. The 2020 Tokyo Olympics will be a major driver in the development of 8K infrastructure, with Japanese broadcaster NHK leading efforts to produce and broadcast Olympic programming to homes. NHK continues to meet or exceed milestones for 8K broadcasting in 2020, as the 2018 Winter Olympics in Pyeongchang, South Korea will mark at least the sixth major world event since 2012 where NHK has demonstrated 8K capture and display. Cameras from Hitachi, Astrodesign, Ikegami, Sharp and Sony address the many challenges in capturing 8K video. The report describes features of these cameras and suggested pricing. The transmission parameters for satellite broadcast of 8K content are detailed, as satellite companies take the lead in broadcasting, addressing the challenges of handling the massive bandwidth required to bring this content to the home. Activities the HDMI Forum and other connectivity solutions are taking to address the increased bandwidth required for 8K. The display industry plans for massive expansion of Gen 10.5 capacity, which will enable efficient production of 65" and 75" display panels for both LCD and OLED TV. Capacity of Gen 10+ substrates for displays is expected to increase from 8 million square meters in 2017 to at least 75 million square meters in 2022. Challenges to enable flat panel displays, including the substantial increase in backlight and driver circuitry costs and the impact on yields. Total manufacturing costs for 8K 65" LCD panels are estimated at $1000 per panel currently and are expected to be reduced to $595 by 2021. Costs for OLED panels are estimated at $1830 today and the report includes cost estimates in 2021. Sales of 8K Flat Panel TVs are expected to increase from 0.1 million in 2018 to 5.8 million in 2022, with China leading the way representing more than 60% of the total market during this period. 8K TVs are expected to include advanced features like HDR, wide color gamut and advanced upscaling. Native 8K content will be limited so upscaling will be a differentiating feature. "While the benefit of simply increasing pixel count from 4K to 8K is weak except for the largest TV sizes, there will be significant panel and TV supplier 'push' that will foster adoption in a way that is similar to the 4K adoption pattern, but at a slower pace," noted Chris Chinnock, President/Founder of Insight Media. 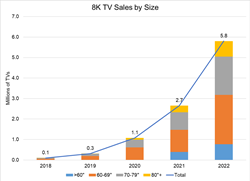 DSCC Co-Founder & President Bob O'Brien added, "8K represents the next generation of the TV industry, and with the massive increases in Gen 10.5 capacity planned in the next few years, the adoption of 8K technology will be a key factor in the success of the flat panel industry. We are delighted to partner with Insight Media to provide clients a comprehensive view of the 8K landscape." For more information and pricing, please contact Dustin at dustin(at)displaysupplychain(dot)com and (832) 451-4909. Display Supply Chain Consultants (DSCC) was formed by experienced display market analysts from throughout the display supply chain and delivers valuable insights through consulting, syndicated reports and events. The company has offices in the US, Japan, and China. They can be found on the web at http://www.displaysupplychain.com and can be reached in the US at info(at)displaysupplychain(dot)com or (512) 577-3672. Insight Media is a consultancy focused on emerging display-related technologies and products in the cinema, broadcast, ProAV, consumer electronics and display industries. Insight Media offers consulting and writing services and organizes display-driven events focusing on 8K, HDR, wide color gamut, microLEDs, training and simulation, VR/AR and other emerging trends. To see how we can help your organization, contact us at info(at)insightmedia(dot)info or 203-831-8464.